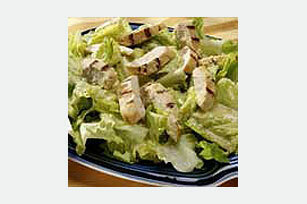 In this tasty salad, chicken breasts are grilled with Dijon mustard and served with Parmesan cheese and a lemon-garlic dressing over romaine lettuce. Preheat grill to medium heat. Brush chicken with 2 Tbsp. of the mustard. Grill 15 min. or until chicken is cooked through (170°F), turning over after 8 min. Cut chicken diagonally into thin slices; set aside. Combine remaining 1 Tbsp. mustard, the oil, garlic, lemon juice and cheese in medium bowl. Cover large platter with lettuce; top with chicken. Drizzle with the mustard mixture. Brush chicken with 2 Tbsp. of the mustard as directed; place on rack of broiler pan. Broil 5 to 7 inches from heat 15 min. or until cooked through (170°F). Continue as directed. Serve sprinkled with additional KRAFT Grated Parmesan Cheese.